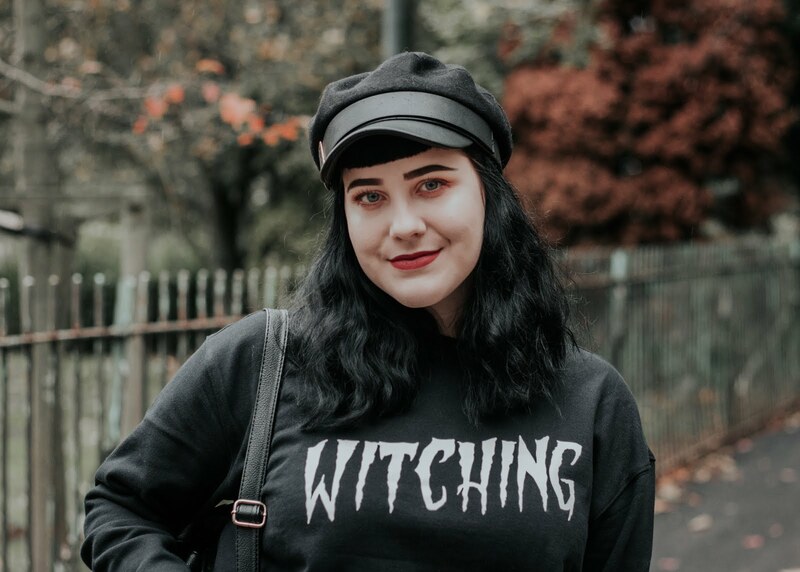 Doing a series of blog posts has always been something I've been considering doing, I had the idea that I wanted an item that I could style in different ways to create completely different looks. But I wasn't sure what item I wanted to do this with... Until I found these beautiful suit trousers! 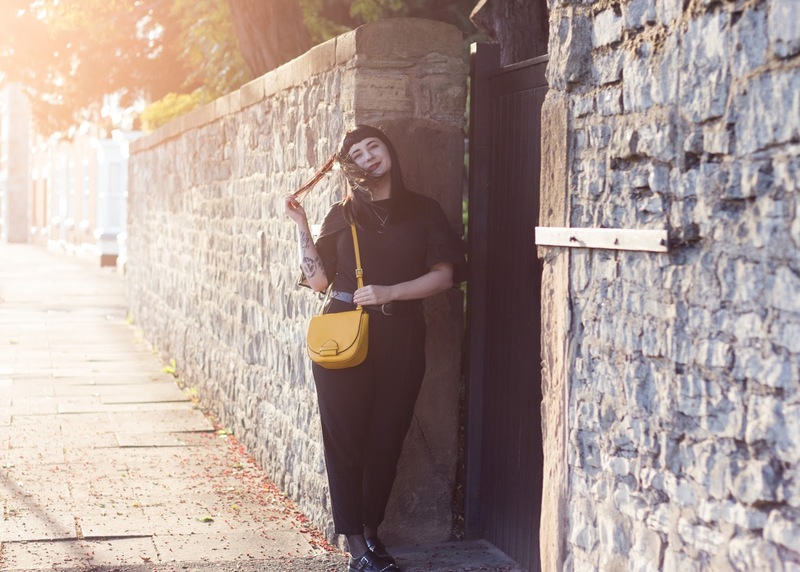 Trousers aren't something you often see me wearing, I love the comfort of culottes but I never opt for proper trousers or jeans of any sorts. 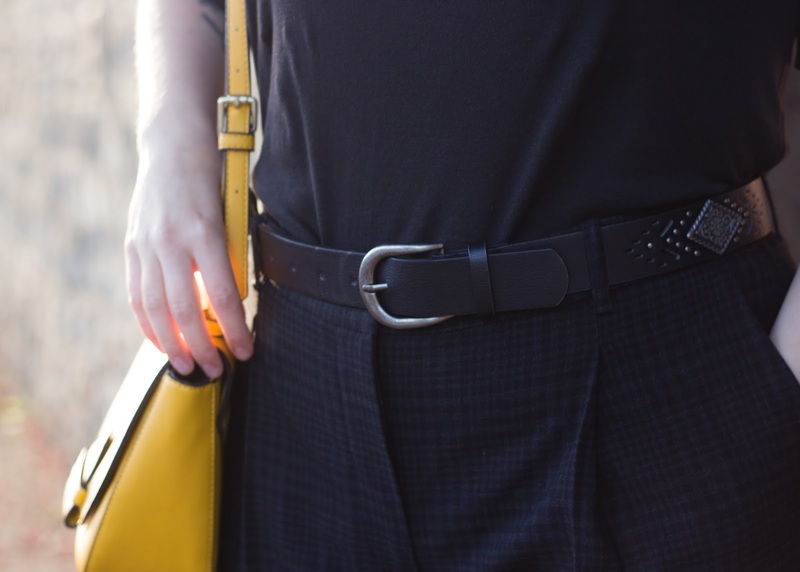 Lately I've wanted to expand my wardrobe and bring in more trousers and warmer garments for the autumn winter months so I've low key been keeping my eye out for some trousers that would win me over. 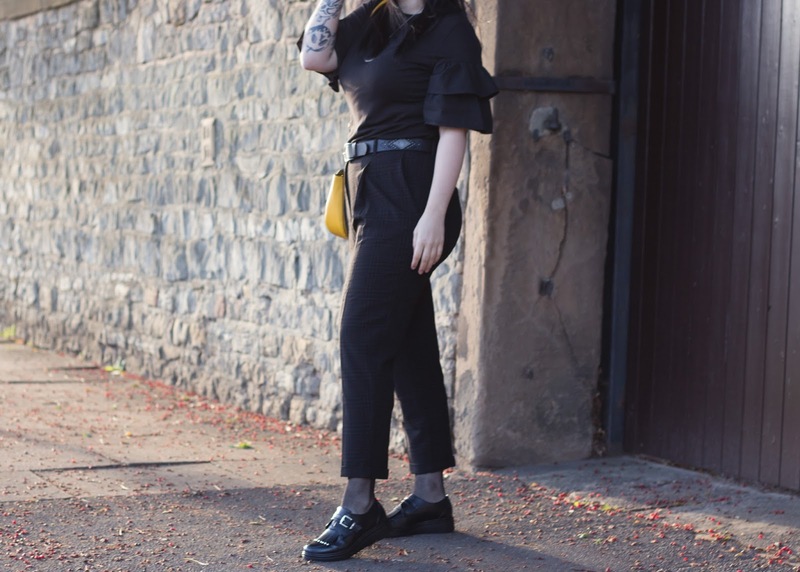 Finding these trousers was kind of fate if I'm honest, they're a nice print, they're high waisted and they are some how short enough to look a bit cropped on me! How lovely are they?! 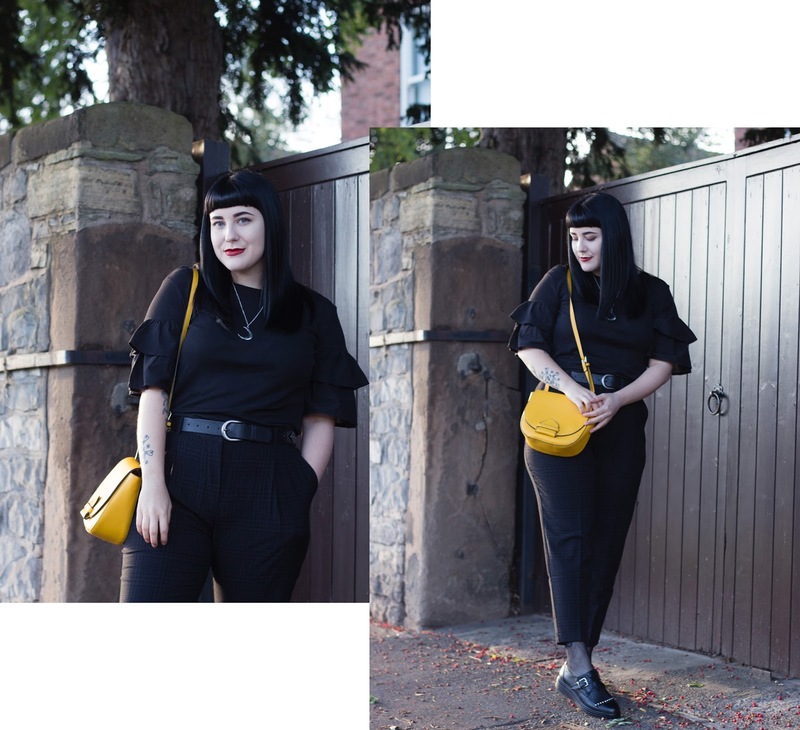 The first outfit I decided to style for this little series of posts is a more dressed up outfit, it's not often I get the opportunity to go somewhere that requires dressing up but I loved styling this! For me, each part of the outfit has parts that stand out. The trousers have a wonderful fit and print, despite them being quite dark they will easily suit being styled in different ways. 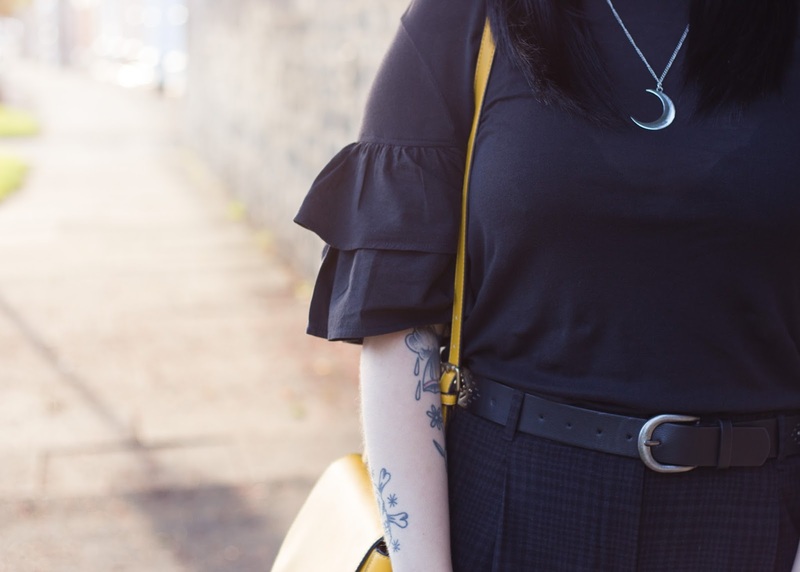 The top has its frilled sleeves, I'm a massive fan of frills and these add a bit of detail instead of having a plain black top, like I had originally planned! How wonderful are the shoes? They're like a perfect mix of loafers/brogues/creepers. I love how they have a thick sole and little details that add to the overall look, like the tiny little studs that they have on them. I have been in dire need of a new pair of shoes for a while, and I saw these for nine pounds and I couldn't resist. They are really comfortable, and didn't rub like I expected. Instead of wearing a simple pair of socks I decided to wear a pair of fishnet tights underneath and I am absolutely living for this combination! I think the fishnets add a little bit of my beloved grunge look, but in a really subtle way. 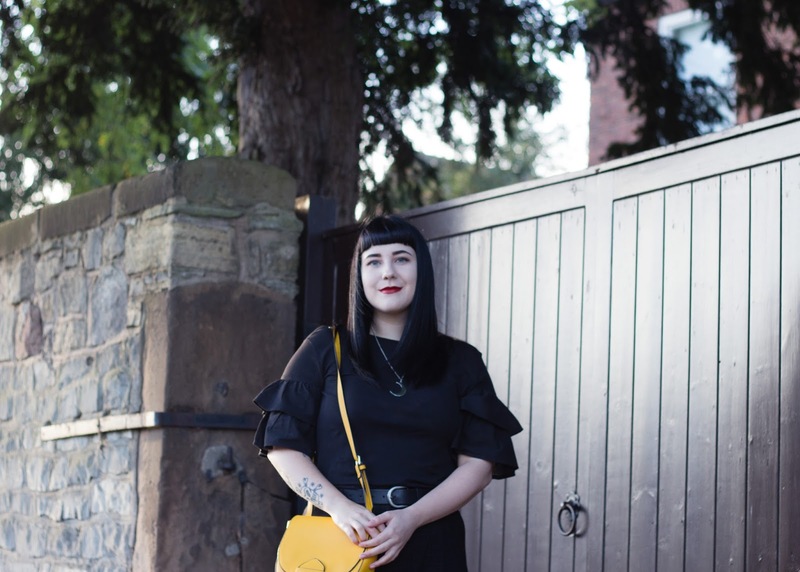 To finish off the whole outfit I added a simple pop of colour with this cute little mustard yellow bag, which is small enough to take out with you for drinks or when going out for a meal, which is definitely what I'd wear this outfit for! 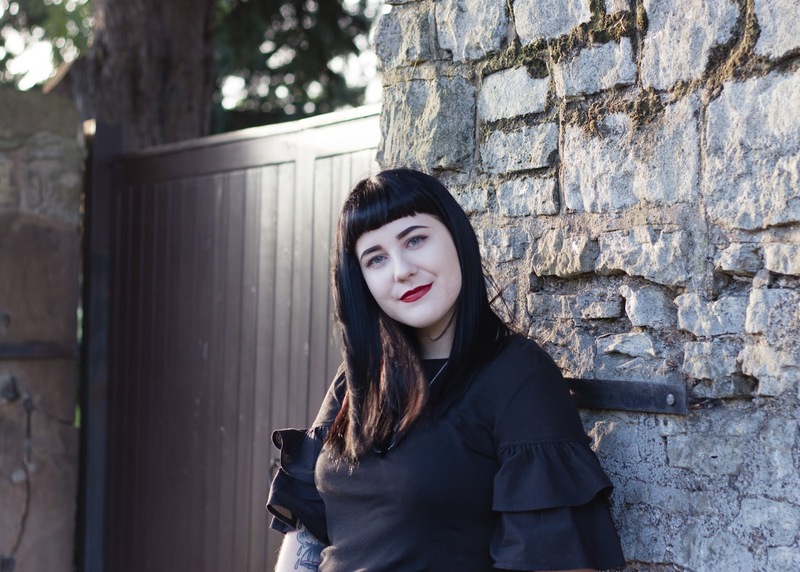 I really enjoy these photographs, as you can tell the sun came out so brightly on a couple of them but we decided to keep them as it looks so good! 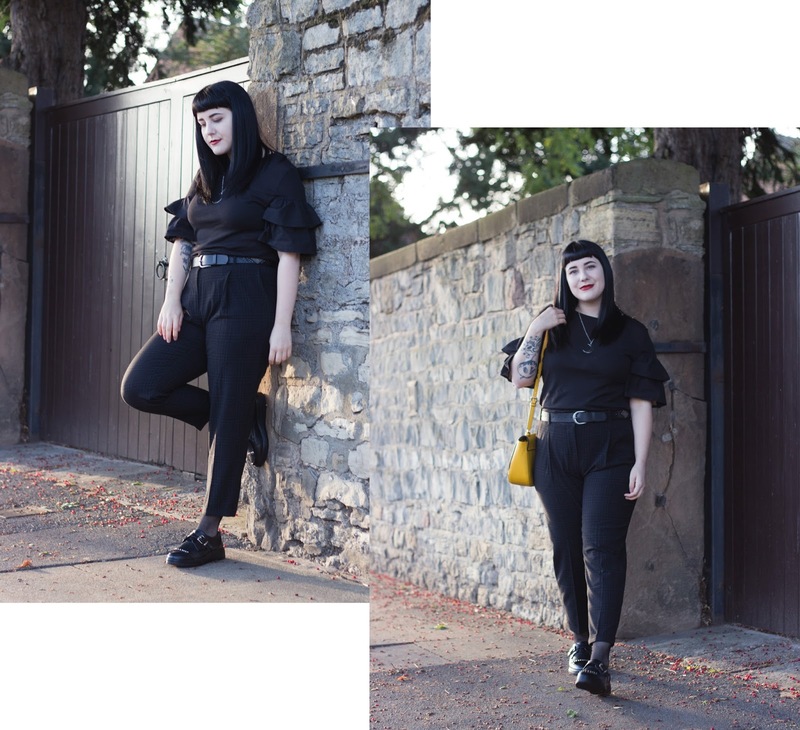 To say I'm not a trousers person, and I felt very unconfident when wearing them, I'm looking forward to bringing out a few posts styling them in different ways! The outfit's design is simple yet elegant. The presence of many photos indicates that the blogger is not afraid to present their opinions before the world and are quite outspoken.